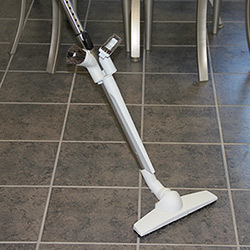 Get vacuum wands and nozzles up off the floor and snug to the wall. The front rubber grip tightly holds any 1 1/4″ metal or plastic tube set-up in place on the wall – just push it into the rubber grip and it holds tight. Slip if off the hose hanger and transport it to your work areas. You’ll love how much it holds and how strong it is. The Zipper Padded Hose Sock is fully padded, washable, and easy to install, the beautiful blue or gray Zippered Hose Sock Cover fits on all central vacuum hoses. It’s like a soft sleeping bag for your central vacuum hose.